When I tell someone that I just returned from the Azores, I'm often greeted by a mass of misconceptions or confusions. Many don't realize that this archipelago is part of Portugal. But even those who do, believe it's hard to get to and requires a very expensive flight. Not true on all accounts. In fact, the Azores are only 4+ hours from Boston yet you feel like you're on the other side of the earth. Though not known for their beaches, the Azores present a wealth of opportunities to get in touch with nature while also finding a place that remains true to its traditions. Chris Christensen at the Amateur Traveler just interviewed me on the Azores. Podcast correction: I may have mentioned in the past that I don't speak Portuguese. And subsequent to my interview, I found out that, though the interviewer suggested that the name Ponta Delgada had something to do with the door of a cat, the derivation of this word is "thin point." And one of my kind readers also commented to that effect. It's always good to have keen-eared, linguistic-focused people reading my blog. Thanks for your informative post. Hope this will help others who are seeking this types of information. Interesting podcast however please note that "Ponta Delgada" has nothing to do with cats or doors! That would be "Porta do Gato"...! "Thin tip" or "narrow point" would be the literal translation of the name of the capital. I would imagine the name might have something to do with the shape of the island or area around the capital. Just thought I'd let you know! Hi Chris, It was the interviewer who suggested that translation, which I had never heard of before. And, given that I don't speak Portuguese, I just let his comment pass. But thanks for your keen ear. The Azores is not a place I would normally think of visiting, but thanks for the suggestion. We loved Portugal. Chances are we would love the Azores, too. Thanks for the reply. Of course, I understand, just thought I'd point it out. Keep up the good work! Hi Alexandra, Most people don't think about the Azores. But I know if you loved mainland Portugal, you'll adore the Azores. I recall seeing a program with television host Meredith Viera exploring her family's roots in the Azores -- her grandparents came from Falal, I believe. interesting to think of those images while listening to your podcast. Wonderful recommendations, especially that hotel in Flores! Azores is one of the world's best whale-watching destinations and it also has Europe's only plantation of tea. 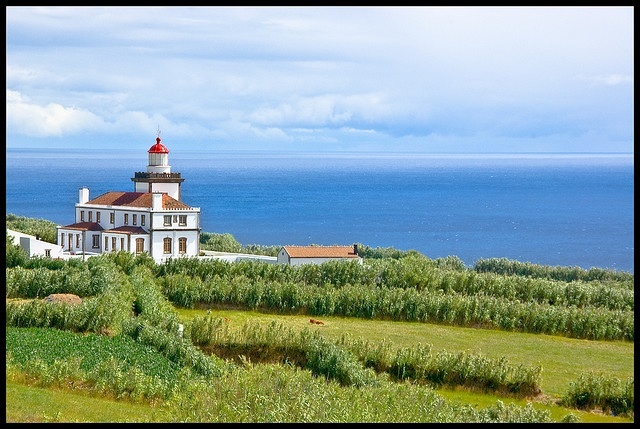 It's in São Miguel and it's free to visit! A number of years ago my brother and his wife sailed to the Azores from Florida (then to Europe). I always associated sailing with the Azores, not flying. So interesting to read this. From their stories, it sounded like a cool place. So many neat places to visit I haven't even thought of, thanks for this post! I've never heard of the Azores. It sounds like a beautiful place. We have friends living in Portugual, I'll have to ask if they've been there. Just wanted to say how much I enjoyed the Amatuer Traveller Podcast. The Azores is a destination I have wanted to visit for many years! Living in England I have no real excuse other than cost. I will get there, thanks again. Hi kerry, thanks so much. Glad you enjoyed it. Hi anonymous, yes, good points. But hard to talk about everything in the time allotted. The tea plantation is lovely. I spent time tasting teas, checking out the old machines, and exploring the grounds when I was there. And, yes, of course, the Azores are well known for their whale watching possibilities. Hi merr, The Azores is a perfect sailing destination. I didn't have a chance to travel by that mode of transportation -- though I did take ferries. Very fun. Hi Living Large, The Azores are not usually on anyone's list, that's for sure. But well worth a visit. In the podcast you mention the incredible value of your local guide for the Azores. Any suggestions or tips for connecting with someone who can provide that kind of expertise?